In our previous discussion we came across Hibernate One to One Mapping using Annotation. In this particular blog we will see what is hibernate one to many relationship and how to implement it using Annotations. We will demonstrate the relationship by taking two model classes 'Student' and 'StudentMarks' and try to establish a one to many relationship in between them. -- Data exporting was unselected. In this particular blog we came across 'Hibernate One to Many mapping and, implementation using annotations'. 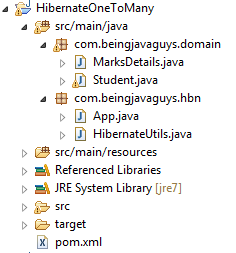 In upcoming blogs we will see 'Hibernate Many to Many mapping' and Other Implementations in Java.